New technology which makes it possible to study the finer details of some of the world’s greatest historical artefacts has been developed by computer scientists and archaeologists at the University of Southampton in conjunction with academics at the University of Oxford. Dr Kirk Martinez of ECS–Electronics and Computer Science at the University of Southampton and the team have developed two Reflectance Transformation Imaging (RTI) systems to capture images of documentary texts and archaeological material. The systems takes 76 pictures of artefacts with the light in different positions, then creates a new type of RTI image, which enables the viewer to move the virtual light around the image to focus on the detail. The RTI technology systems developed by the project will allow researchers to study documentary and other artefacts remotely in great detail without being restricted by fixed lighting angles. The result will be to ensure that high-quality digital versions of these materials can be consulted by scholars worldwide. “Hewlett Packard Research Laboratories invented this technology a few years ago and it has been used sporadically around the world,” said Dr Martinez. “What we have done is develop the technology so that it is fast enough to be usable every day in a museum situation where you have lots of objects that need scanning." During the course of the project, the teams scanned 100 clay tablets, most of which were typically about 5,000 years old. “If you really wanted to look at a picture to investigate fine details at the moment without this technology, you would be hard pressed to see any detail on current archive photos – and may need to rephotograph,” said Dr Martinez. This technology is currently being used in the Ashmolean Museum in Oxford and it has recently been tested in the British Museum and in the National Gallery. The software developed for these systems will be available open source online this autumn together with a guide to making your own system. 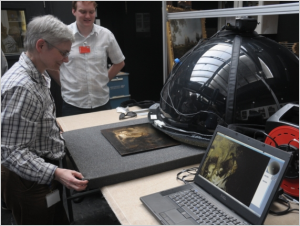 The 12-month Reflectance Transformation Imaging (RTI) System for Ancient Document Artefacts was funded by the Arts and Humanities Research Council’s Digital Equipment and Database for Impact. The academic team members are: Dr Graeme Earl, Dr Kirk Martinez and PhD student Philip Basford of the University of Southampton, and Professor Alan Bowman, Dr Charles Crowther and Dr Jacob Dahl, University of Oxford.